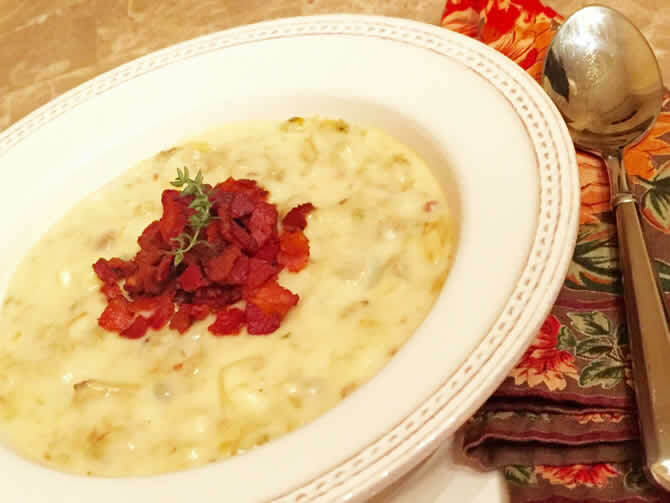 A great dinner standby, this rich, delicious chowder is the perfect comfort food…and it’s chock-full of bacon! Sauté the Hoffy bacon in a large kettle or stockpot over medium heat. When crisp, remove the bacon with a slotted spoon and set aside. Add the onions to the bacon grease and sauté until tender, about 10 minutes. Add the potatoes, garlic and thyme and sauté 2 minutes. Bring to a boil, then reduce to a simmer and cook until the potatoes are tender, about 10 minutes. When the potatoes are tender, add half of the bacon back to the soup along with the clam juice, half & half, clams, hot sauce and salt and pepper, to taste. Bring the mixture to a simmer (do not boil), and simmer for 5 minutes or until heated through.